Gust has recently released two new gameplay videos for the new Atelier series game Atelier Escha & Logy. Naturally, they’re titled after our two main characters Escha & Logy. The first video shows off what looks to be a giant Dragon enemy, which could also possibly be a boss in the game. The first video also showcases some of the two characters’ abilities. The footage ends with a demonstration of one of the unison abilities used by the duo. On the other hand, the second video showcases a few snippets of different battles and a peek at the new battle system. 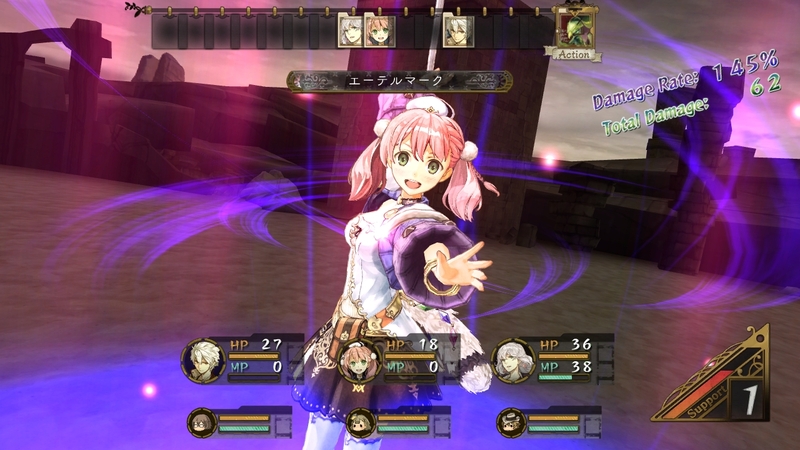 It also showcases more of Escha and Logy’s various skills. Check out both of these videos below. As said before, while the titles of these two videos would seem to mean they’re specifically focused on are the main characters, they’re not mutually exclusive. In fact, these two videos show off the game’s other playable party members and their various capabilities as well. Atelier Escha & Logy: Alchemists of Dusk Sky is a PlayStation 3 exclusive and is due out in Japan on June 27 of this year. No localization announcement for the West has been made yet, but hopefully we will hear something at E3 or sometime close to the game’s Japanese release, which is nearing pretty fast.